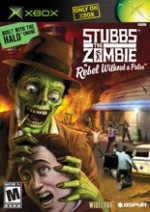 flashzombies.com - "Stubbs the Zombie"
FUN FUN FUN! 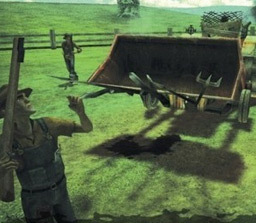 This game is a must have for any zombie fan. 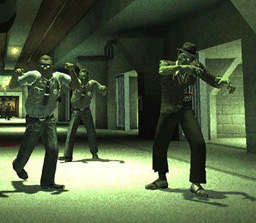 You get to eat brains, and make massive zombie army's and have them turn others into zombies in a small version of GTA3. (Grand Theft Auto 3) Heads exploding, arms pulling off, mind control and speeches about BRAINS. This game was great. Only complaint is the length of the game. 14 levels of brain eating. Needs more, If they make a part 2, definitely make it GTA style completely, with huge cities and millions of people. That would be addictive. I played this game on the hardest level (INSANE). This option didn't add zombies, it just made the living harder to kill. Buy this game today, great for parties. Bring your buddies over for a game of zombie eating. This game does have a 2 player option. For double the fun. I don't want to say much more. Just know that the second level is kind of tedious in a cavern type area. After you beat this level your back on the city streets, police stations and peoples houses! Enjoy Stubbs the ZOMBIE! Graphics is nothing out of the ordinary. However there is a camera trick they do, where its like static tv. As if your in the 50's to give it that something different. The cut scenes are funny and that's mainly what matters most. The content then the graphics. Controls are not bad at all, maybe if they made eating brains a bit easier. Also for the human beings to stop running away from you. They should sit there so you can eat as many brains as you like. But i guess that wouldn't be that challenging. From bomb throwing, to walking upside down as your arm. Control works perfectly. Oh yea, made with the Halo engine, now you have to buy it! What do you think of this game? 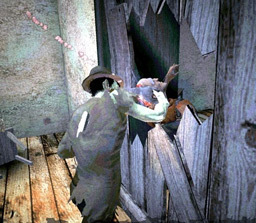 Click here to discuss Stubbs the Zombie in our forum.